An artist rendering looking West down Main Street shows the Egg and I on the right with a recommended hotel on the left, overlooking the canal. A walking trail is illustrated behind the hotel. SOUTH HADLEY – Work with our assets. That’s what a team of architects have suggested South Hadley do in order to revitalize the Falls area downtown, a sort of diamond in the rough. 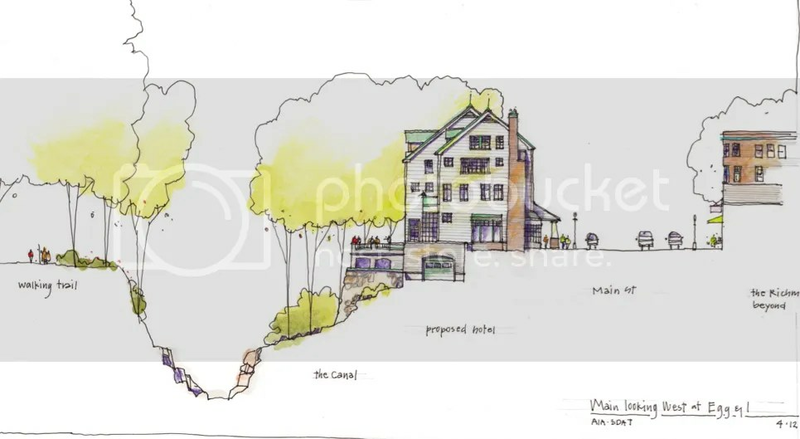 Through a $15,000 grant and the fundraising of $5,000, the town was able to bring a team of six architects from the Sustainable Design Assessment Team [SDAT] Program of the American Institute of Architects [AIA] to South Hadley to study and reveal ways in which the Falls could rise, revitalized. A public forum was held last Monday for residents to voice what they would like to see happen with the Falls, and again on Wednesday for the architects to present their recommendations and how to move forward with the improvements. Wednesday’s public hearing and presentation drew a crowd large enough to fill the entire town hall. From existing historical structures and streets constructed in a walkable grid to continuous green spaces and easy access to the Connecticut River, South Hadley Falls has “good bones,” said Cheryl Morgan of the AIA and professor of architecture at Auburn University. And with those bones, South Hadley can create an area inviting to both residents and businesses alike. Spaces gain vitality when they become a place where people want to be. In order to restore the Falls, South Hadley must remember its roots, which took hold in the canal. “You have a unique opportunity here that no one else has,” said architect Wendy Weber Salvati, an environmental planner and specialist in land use from New York. All roads in South Hadley Falls lead to water, and the waterfront is easily accessible. She spoke of the difficulty in regaining access to waterfront once impediments such as highways have been constructed in the area. Reconnecting to the water visually and physically is a must. So how does South Hadley revitalize its downtown area? For starters, the bridgehead – the area of South Hadley Falls right in front of the South Hadley side of the Veterans’ Bridge – must be beautified. Signs and flowers don’t cut it at what is essentially the gateway to the Falls, said the architects. Retail space should be created to the left and in front of the Veterans’ Bridge on Main and Bridge streets, whether it be as a small card shop, pizza joint or ice cream parlor. A sporting goods store was said would serve the population using the Beachgrounds quite well. It was suggested the South Hadley Electric Light Department [SHELD] building be turned into a Youth Commission building, as the historic building is in good enough condition to be repurposed when SHELD expands into a different location. The area on which sheds housing SHELD equipment stand could be turned into an outdoor amphitheater, which would meld well with the Youth Commission next door. The group could then use – and dually monitor – the amphitheater for Youth Commission events and projects. Off-road bicycle trails are another option South Hadley could choose to add access to the Falls area. The trails could be located solely in South Hadley or the town could choose to connect to the rail trail which runs from Belchertown to Northampton and beyond. In terms of other exercise opportunities, walking trails were suggested be created along the waterfront in the Beachgrounds. One long trail running parallel with the Connecticut River could have paths situated vertically from the main trail extending to entry/exit points on Main Street. These trails could loop around themselves or connect with others.. Artist renderings of the trails show benches positions every few feet. A footbridge over Buttery Brook was another pedestrian improvement offered by the architects. Specialty lodging built on the side of Main Street near St. Patrick’s church and the Old Firehouse Museum was suggested, as well as a hotel on the edge of Main Street overlooking the canal. To repurpose the library building on Bardwell Street after the library has moved on to its new location on West Main and Canal streets, the architects recommended turning the building into a bed-and-breakfast with specialty functions. As for the new library, the architects looked at the plans for it and advised the library be moved to the west nearer the more residential area of that part of the Falls. They also suggested softening the curve of West Main and Canal streets. Rather than repurpose the Fibermark building into offices or residential units, the architects proposed demolishing it and starting anew. And to keep with the town’s asset of having accessible green areas in the Falls, creating a public space adjacent to the new library was encouraged. In it, residents could host birthday parties, family reunions or read books from the library. Altogether, the revitalization suggestions seem daunting. But Bonnie Crockett, an executive director of a successful Main Street program in Baltimore that transformed a local neighborhood, suggested starting small. A “to-do” list should be created listing neighborhood priorities and easiest jobs first. The creation of a Neighborhood Association would allow for one group to be charged with keeping track of the list and current improvements. For starters, adding more street trees along Main Street would be a quick facelift. Taking down the chain link fence around the Beachgrouds, painting fire hydrants and repainting storefronts would be simple feats with large reward, she said. Moving forward on other tasks such as attracting businesses, South Hadley could offer small business support and incentives or create a Main Street program. To volunteer on an implementation committee or future Neighborhood Association, email the SDAT at shsdat@hotmail.com.